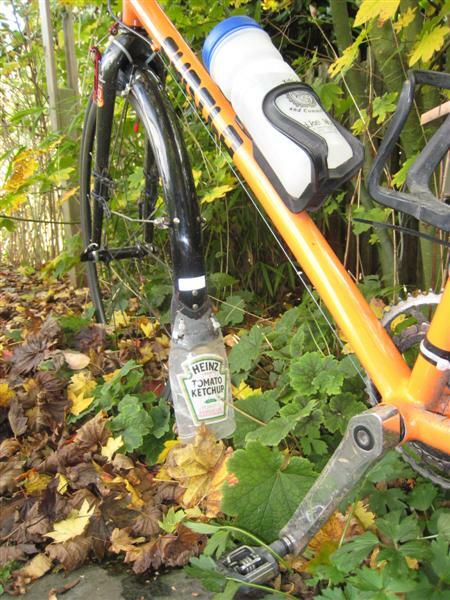 ← Free Beer at Clever Cycles, Portland ?!?! So it follows that nothing says riding in the rain like a big Costco-sized bottle of ketchup-turned buddy flap (mud flap)! I had big plans to make some fancy Rivendell-style tweed/leather mudflaps, but I went back to my reuse roots. 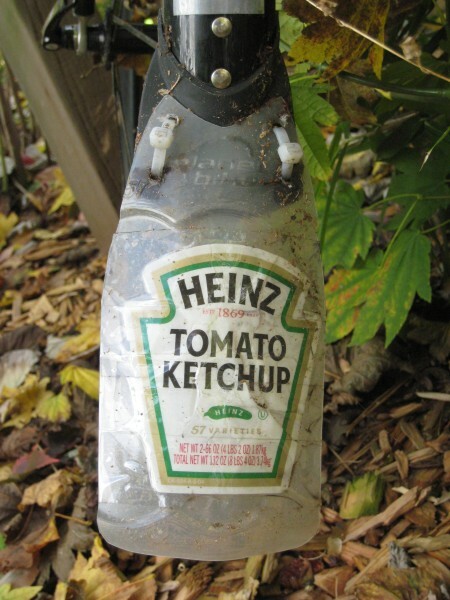 Once I saw the flap-goodness embodied in that giant old ketchup bottle, I don’t know, I just couldn’t sit idly as it was sentenced to the big recycling tub. Really, it’s win-win: I kept the bottle out of the waste stream for its highest-best use, people riding behind me get a good laugh instead of muddy spray to the face, my bike stays cleaner, and I get to show off some bitchin’ fast-food style. and so on (I’ll add some more here as I dig up more of my old resources). 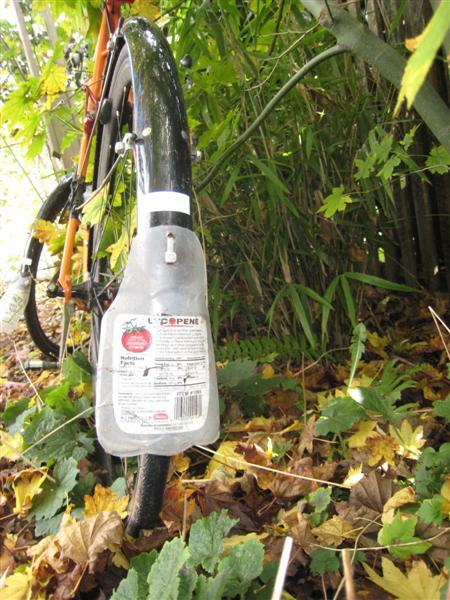 This entry was posted in bikes, sustainability, weather, wrenchin' and tagged bikes, buddyflaps, commuting, fenders, gear, rain, tips. Bookmark the permalink. Sweet! I need some mud flaps on my commuter and was thinking about the Rivendell version, but I’m thinking I’ll do the rubber stair tread version instead and make it nice and long to help keep my shoes dry. I guess I could use part of the white OJ jug, but I like the idea of the flap being flexible. I think there’s a budding business idea in there somewhere. Hey Smudgemo — thanks for visiting. I like your blog, btw. For what it’s worth, these are pretty flexible. I’ve done milk cartons (too cheap looking), bleach bottles (too stiff) detergent bottles, water bottles, and so on… your imagination is really the only limit. If only I could find a way to make some beer bottle flaps. That would be perfect. One possible improvement – I have a bottle of Heinz at home that has a label saying: “Will Work For Food.” Part of a series of slogans sent in by Heinz fans. Another source for mud flaps, if you’re looking for a more OEM look, is back at your original manufacurer, Planet Bike. You can buy separately those great extra-long mud flaps they now offer on their Cascadia fenders. I’ve found they’re compatible also with SKS fenders. always glad to know there’s an option to cutting up ketchup bottles. I was thinking about moving on to maple syrup next.